The traditional approach of watchmaking, any watchmaker will tell you, starts from function; for what is the purpose of a watch if not to mark the passage of time? The stalwarts of horology have made it their mission to create the most accurate of instruments, from chronographs that can measure time down to 1/100th of a second, to complications that can keep track of the moon’s many phases and more. Van Cleef & Arpels however, has thrown all notions of conventional timekeeping out the window. Van Cleef & Arpels is first and foremost a jeweler; I have always been fascinated with the talismanic charm of the Alhambra and smitten with the playfulness of the Perlée, rings of beaded gold that shimmered on the hands and wrists of the women who wore them. Its high jewelry is unsurpassed in its mastery of skills and choice of stunning stones. But at the end of the day, it wasn’t the number of carats on a necklace that captured my heart – a songbird nestling its baby under its wing in the Le Secret collection, foam-crested waves in the Seven Seas – it was the tale each piece told that left a lasting impression. I knew the same people who invented Zip necklaces, the Mystery Set technique and transformative jewelry weren’t simply going to put the rarest of diamonds on a dial and call it a day. Still, my first encounter with Van Cleef & Arpels’ Midnight Planétarium left me completely speechless. I still remember it was some time in 2015 that I laid eyes on it and forgot I was looking at a watch. It was a mechanical marvel, a miniature solar system in the palm of my hand that told the age-old story of astronomy and the universe beyond in the most poetic manner possible. The meaning of Van Cleef & Arpels’ Poetic Astronomy narrative was apparent all at once on the Midnight Planétarium. Six tiny orbs of precious stones that mimicked the actual movement of six planets circled around the sun: Earth, Mercury, Venus, Mars, Jupiter and Saturn. Mercury would orbit around the dial in 88 days, Venus, in 224 days, and most impressively, it would take Saturn 29 years to make a full rotation around the dial. The magic of the universe, brought to life in a precious setting, secured around the wrist. It was one of Van Cleef & Arpels’ most complicated wristwatches at the time, and the work of expert astronomical horologer, Christiaan Van Der Klaauw, who has dedicated his life’s work to the making of astronomical complications. All of Van Cleef & Arpels’ watches first begin as a story, be it a story of the heaven and stars, the story of lovers, or the story of fairies. 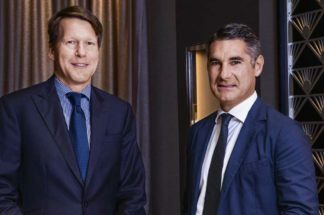 To build a narrative first before getting down to the nitty-gritty of building a watch, is an inverted approach that is uniquely Van Cleef & Arpels, and it collaborates with the best in the industry to help bring its vision to reality. 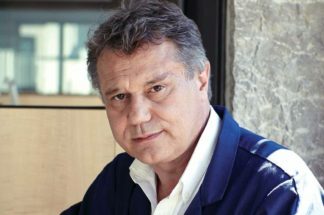 Dutch clockmaker Van Der Klaauw is one of Van Cleef & Arpels’ partners. The other is Agenhor, whose owner, Jean-Marc Wiederrecht, is a legend in the industry. In fact, Poetic Complications all started when Van Cleef & Arpels challenged the veteran watchmaker to find a mechanical solution that could tell the story of the four seasons, leading to the creation of the Quantième de Saison in 2006. Agenhor is also an expert in the creation of retrograde movements, a special movement that allows the hands to trace an arc along the dial before returning in an instant to its original position and begin its next arc in an elegant, fluttering dance. 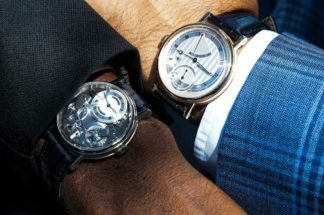 Many of the Poetic Complication timepieces drew on these innovations to bring their clever designs to fruition: the retrograde movement for instance, appears many times in the Lady Arpels Pont des Amoureux, the Butterfly Symphony and the Lady Arpels Féerie watches, each with its own unique story to tell. Two lovers approach each other on the Pont des Arts, pausing for a fleeting kiss just at noon and midnight, before they are flung back to the far sides of the bridge to start their journey all over again. In 2003, Van Cleef & Arpels presented the Midsummer Night’s Dream high-jewelry collection, a dazzling and magical tribute to impish and playful fairies, slender magical beings depicted in graceful poses with delicate wings raised in mid-flight, flitting about the enchanted forest. Two years later, the Maison combined the fairy motif, a symbol of femininity and mischief, with the complicated retrograde movement to create the Lady Arpels Féerie watch. On the dial sits a diamond-set fairy, like a protective muse that watches over the passage of time, her face represented with an oval-cut diamond. With her magic wand, the fairy points out the hours on the left side, while the longest tip of her gossamer wings indicates the minutes. The Lady Arpels Féerie watch’s movement consists of two parts, Agenhor’s retrograde module is set upon a Jaeger-LeCoultre movement with 30 hours of power reserve. Sculpted in white gold with round diamonds on the bezel, the watch comes with a red or blue enamel dial, with guilloché engraving in a lozenge pattern that enhances the luminosity and depth of the dial, setting the stage for the diamond fairy to make her magical apparition. 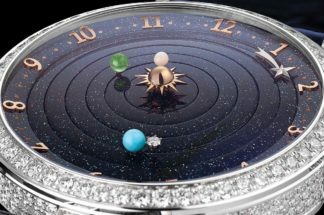 The Lady Arpels Planétarium, released this year, is the sequel to the hugely lauded Midnight Planétarium, to this day hailed as one of the most impressive horological creations by Van Cleef & Arpels. On the 38mm white gold watch, the luminous night sky is depicted with a dial made of aventurine, a glittering blue stone that has become more and more popular in recent years. Of course, the allure remains the miniature planetarium – a pink mother-of-pearl bead represents Mercury, green enamel for Venus, turquoise for Earth and a diamond for the Moon. Like the previous version, the planets travel at actual speeds, but this new watch comes with a new innovation, the Moon itself rotates around the Earth in 29.5 days, performing a celestial dance that you can see with your own eyes day after day. Around the periphery of the dial is the time, shown gracefully with a shooting star in rhodium-plated gold. That’s not all the watch does – turn it over and you’ll notice two small apertures that display the day, month and year, that is, if you’re not first mesmerized by the oscillating weight adorned with diamonds in a crescent shape and a turquoise orb. Eager for the next chapter? So are we, and lucky for us, the Maison will surely continue to captivate us with its dazzling creations and remain a classic book we know we’ll never stop revisiting.